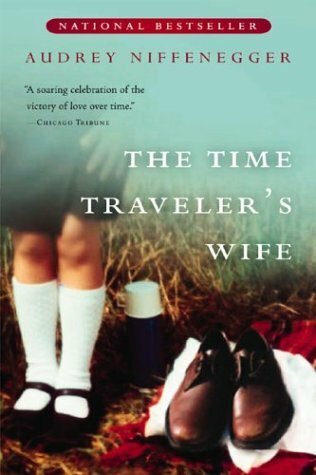 SPOILER warning: If you have never read The Time Traveler’s Wife by Audrey Niffenegger or seen the movie and you plan to do so, please skip over this blog. It will contain spoilers from the story. I never expected when I woke up this morning, that I would be blogging about a book. A book that, until I was coerced by my book club, I had no intention of reading. However, as I sat on my couch, sobbing through the last 60 pages or so, I knew I needed to talk/write about it. This book was difficult for me to read and fascinating at the same time. I felt a connection to the main character, Henry, because he also has a genetic disease which he has no control over. Granted, CF and time traveling are just a tad different, but regardless, he can’t control what happens with his disease. I often feel like that’s the case with CF as well. We can try everything to get it right, but sometimes we still get sick and need IVs or extra treatments. Sadly, I have been reminded of this aspect of CF again and again with friends who have suddenly become ill.
Having that connection with the main character, I was drawn in pretty quickly to the book. So as the novel continued, I found myself struggling and relating to their journey with infertility/miscarriages. This section was incredibly difficult to read. As Henry and Clare (the two main characters) make it through 6 miscarriages, I found myself wondering if I would have stopped at one. These thoughts may also be due to recent circumstances in the CF community, but either way it made me think. Naively, I thought that this part was going to be the most emotional section, but I was wrong. Definitely wrong. As the book began nearing it’s end, Henry has traveled into the future and has seen the date of his own death. He knows his death is coming, much sooner than he would like, and he begins to think about his life. He think about his wife and the great moments they have had and also the sadness that has engulfed their lives at times. He thinks about his daughter and how 5 years with her is not enough…how he longs for more time with her. Henry is suddenly forced into the mindset that I believe many people with chronic diseases face at one point or another: there is just simply not enough time. I’m one of those cysters who firmly believes she will live a long time with this disease or that it will not be the disease that takes me out of this world. That being said, I have still thought about my life ending early. I have thought about saying my final goodbyes to friends and family…and to my dear husband and it tears me up to even imagine it. So, when I read about Henry thanking his friends for their loyalty, support, and love, and when I read about his goodbye to Clare as she tries to comprehend what is happening, I bawled. I’m not talking about little tears here and there, I mean full-out sobbing. I have imagined this scenario enough that reading it seemed too real. So the book left me realizing that I have, in recent days, been consumed with the desire to get through the day and finally get to sleep (our days have been incredibly busy with very little besides work). I have been missing the opportunity to live every moment to its fullest. I have been neglecting holding my husband’s hand just a little longer while we sit on the couch. I haven’t kissed him as much as I want to and I haven’t said I love you nearly enough. All I desire is to have him home with me right now so I can hold him and never let him go. CF or no CF, none of us can escape time. All that should matter is the here and the now, and a lot of us (myself included) forget this way too often. ← CFRD is . . . Such a good book; I believe I cried like a baby…. The movie wasn't half bad either. I haven't read that book for almost 10 years but it had such a strong impact on me that I will surely never forget it! Beth – I'm actually watching the movie in the next few days. It's interesting to hear you say you will never forget it. I get that feeling with this book as well. I've surely never felt compelled to write about my thoughts on a book before, so that's saying something!! Bridget – I did exactly that…I smothered him with attention all weekend long. Now 5 whole days without him again :(!